Lovely Recipes for Produce from the Global Garden! Karen Caplan loves the produce she sells at Frieda's and this cookbook grew out of a need to fulfill recipe requests from her clients. Fresh produce is Karen's passion and she started working part-time in the company at a young age. 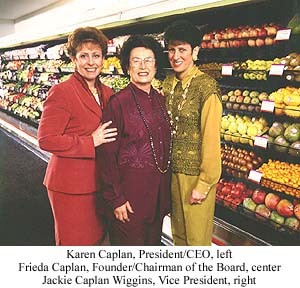 Her mother, Frieda Caplan, first introduced kiwifruit to America and inspired Karen to carry on her families tradition of introducing new delicacies. Part of her job includes traveling to exotic locations around the globe to get the scoop on the next new product. While this cookbook is also a journey to discover how to use exotic fruits and vegetables, you will find many recipes like Chicken Wraps with Cilantro and Avocado which contains ingredients we are all familiar with. Marlene Brown helped to develop the recipes and has been creating recipes for Frieda's since 1982. Dr. Nancy Berkoff is a certified chef and also assisted in the writing of this cookbook. The recipes will be loved by adventurous home cooks and chefs alike. You will also recognize the more common celery root, cilantro, elephant garlic, fennel, ginger, horseradish, leeks, mangoes, pearl onions, purple potatoes, shallots and spaghetti squash that are appearing in so many stores lately. If you walk into your local grocery store, more than likely Frieda's produce will be there. If you visit Frieda's Web site you can see where the produce is being sold in your state. The book design is beautiful and fresh pleasant purple, an almost pumpkin orange and kiwi green colors are found throughout the cookbook. Each recipe heading is in purple and there are various notes in little boxes to give you information about the selections being incorporated into each dish. Headnotes give a tip on recipe usage, explains the texture or a gives a unique serving idea. Beautiful color pictures fill many of the pages and you have to see the lime mousse with the horned melons on page 63! The mousse looks so creamy and you could serve it in the summer. The Purple Kiwi Cookbook is organized alphabetically so you can easily find recipes for your favorite produce. You can find recipes for anything from Asian Pears to Wood Ear Mushrooms. This is a collection of over 100 favorite creations inspired by the produce sold at Frieda's. You will especially enjoy the full-color visual glossary to look up what a "tamarillo" looks like. Every item used in this cookbook has its own description, usage information and storage hints. Food writers will also love the detailed descriptions. You will finally know what "cipolline" onions look like. If you have "foodie" friends, they will love these recipes and you are sure to impress them by knowing what to do with kumquats! My advice is to put the whole kumquat in your mouth and chew fast, but Karen has a few good ideas and who would have thought you could put them in a dressing? The recipes just tempt you to try these fascinating fruits and vegetables. Who ever thought of Cactus Pear Sauce over waffles? How about Passion Fruit Sorbet you can make even if you don't own an ice cream maker? Have you been wondering what to do with blood oranges or thought that lychees looked rather fun? I can't wait to try the Chile-Roasted Edamame. Lemongrass looks likes a scallion, but is a paler green. contains "citral essential oil" which is also well known in aromatherapy. My passion lately is lemongrass (which can be kept in your freezer), so when I found out this book had recipes for lemongrass, I got a bit excited. You just don't find that many recipes except in Thai cookbooks and then they are normally very spicy. Karen includes a delicious "Light Lemon Hollandaise" which would even make Julia Child proud. You mix all the ingredients in the blender and then cook it for just a few minutes in a saucepan. Well, once you taste this sauce you will start thinking about what you want to serve it with. I fried some floured cod (cut into 1-inch by 1 1/2-inch pieces) with some lemon pepper in a bit of butter. Then, I fried up a basil leaf right in the pan next to the cod. A piece of lemongrass also sizzled in the pan and then for a final presentation I set each piece of fish on a spoonful of the Lemongrass Hollandaise sauce on a medium size plate and topped it with a fried basil leaf. To garnish: a piece of lemon, a fresh basil leaf, a few cut stalks of the fried lemon grass in a fan shape and of course a slice of unpeeled kiwi in Frieda Caplan's honor! Wow, I had created a new recipe just from one idea of using lemon grass in hollandaise sauce. That is what this book will do. It will inspire you to be adventurous. So why is this cookbook called the "Purple" Kiwi Cookbook? Well, I will keep that a secret and let you find out from Karen Caplan when she tells you her wonderful family history at the beginning of this cookbook. Karen also recalls how her mother would return from work with the wonderful aroma of mangoes and citrus fruit and she jokingly calls this "eau de mango-papaya-pineapple-grapefruit.". Little did Karen know at the time that this would become the sweet scent of success. The best life sure does come from doing what you love and it shows in this new cookbook! Well, get ready for a journey into the flavors of the exotic produce Frieda's has been introducing into American cuisine for years. The Purple Kiwi Cookbook will bring out the wild side of your cooking nature and that is why I love it! Janet Marinelli and a team of botanists showcase over 2,000 of the planet's rarest and most imperiled plant species. Can these plants be saved by ordinary gardeners? When plants have been dug up from natural areas they can threaten or deplete the natural resources. Whereas, a collection of orchids could be an important gene pool for more rare species. Some plants like the Chocolate Cosmos is only found in gardens and was last seen in its native habitat back in 1902. Private gardens can become a refuge for plants that might otherwise now be extinct. 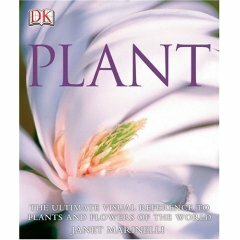 Janet Marinell is on the forefront of the ecological revolution and has been the Director of Publishing at Brooklyn Botanic Garden for the past decade. She has won numerous awards for her writing, including the American Gardener Award. She is a popular lecturer on the subject of ecological garden design and plant conservations. By request, she makes frequent appearances across the U.S. and abroad to pass along her philosophy and gardening techniques. There are many unique features in this book but the most impressive part is the pictures of fields of exotic flowers, maps to show locations and explorations of each global habitat. The authors explore how plants have vastly impacted human societies and also presents plant classification that is easy to understand. PLANT explores the stunning world we live in and introduces the reader to exotic landscapes, forests drenched in mist and flowering plants you will fall in love with and want to save. The vulnerable yellow angels' trumpets emit a powerful fragrance that lures in night-flying butterflies while strange blooms of green cactus-like sunflowers grow from the Dorstenia. Larch "flowers" are born from bark like visual poetry and many of the plants we know about are also on the lists of plants that could become extinct. Like the more familiar Japanese magnolia, Echniacea or Ginkgo biloba. You may want to cultivate your own passionflowers or plant more bulbs. There is a lot to think about. Like, who hasn't sprinkled a wildflower mix into a part of their yard or in a field. There is information about a poppy seed that self-seed vigorously and it is found in "wildflower" seed mixes. It can compete with grasslands and can be very invasive, although stunningly beautiful. A portion of the proceeds for this book will go to plant conservation efforts. This is truly an "ultimate guide" that will inspire your protective instincts. These plants are beautiful and deserve to be saved.